We’re college football fans over here, which means ALL day Saturday from noon on is taken up by football. We spend the mornings at our kids’ sports events and by the time we get home, I don’t have much time to figure out what I’m making for the games, run to the store, make it and still hang out with friends for 8 hours. And hanging out with friends for 8 hours is very important. In light of all those very, very valid reason… football freezer cooking was born! 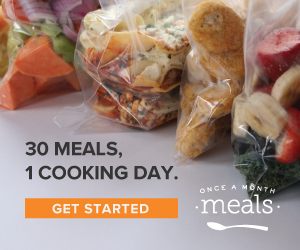 If you haven’t visited Once a Month Meals yet, I highly recommend starting there if you’re interested in freezer meals! It’s a great resource for how to approach freezer meals and filled with lots of recipes for all different tastes. You can customize the recipes and choose meal plans that work for your specific tastes and family size. This is just an example of what I bought that day. I got multiple packs of each (they were about 3-4 days from the SELL BY date when I bought them). I’m well aware that not every store marks their meat down this much… heck, I can’t even always find it this cheap, but you can still buy bulk packs of meat to get a cheaper cost. Once I got home, I threw most of my chicken into a stock pot with water and simmered it, covered, for about an hour until the chicken was cooked through. Once it’s cooled, I shred about 2/3 of it and cubed the other 1/3. About half of all of that got split between quart size bags and it’s officially read for the freezer. I can pull these out anytime I want for a taco bar, dips, sandwich wraps, chicken salad sliders, nachos, white chicken chili, chicken tortilla soup, etc. The rest of the shredded chicken got tossed with some buffalo sauce and melted butter. I’m not picky on my buffalo sauce and I’ll just use whatever I have in the fridge. Some of this got split between quart bags immediately for the freezer. These are great to pull out for buffalo chicken dip, buffalo chicken quesadillas, nachos, sliders, etc. I used the rest for buffalo chicken rolls that I found on Can You Stay for Dinner. I never turn down a chance to use blue cheese. And this is where you’ll see just how cheap I am… I couldn’t bring myself to pay for the broccoli slaw. So I bought a couple heads of broccoli and used my mandoline slicer to julienne them. Love that thing. Don’t toss your broccoli crowns, we’ll be using them later! After I had them all assembled, I baked for half the time suggested in the recipe. I just wanted to firm them up a bit before I froze them. This way I can pull them out of the freezer, and cook them without them getting overdone. While you’re chicken was cooking, throw your ground sausage into a frying pan and get that cooked up. After it’s cooked, you’re ready to make calzones. Grab the pizza dough that you put in the fridge the day before, roll it out and fill it up! For my calzone filling, I use whatever I happen to have on hand, i.e. cooked sausage, cooked ground beef, ricotta, mozzarella cheese, parmesan cheese, diced tomatoes, chopped red and green peppers, etc. Sometimes I even make cheeseburger calzones with ground beef, cheddar cheese, onions, tomatoes and mustard. Just mix it all up and then put a couple tablespoons on a small piece of dough that was rolled out. Fold the top over, crimp the edges with a fork, spray the top or brush with oil and then bake for about 8 minutes or so. They will not be done baking, but remember, I only bake things halfway if I’m going to freeze it. With the rest of the cooked sausage, I grabbed my wonton wrappers and made some mini sausage cups. Spray a mini cupcake pan and insert the wonton wrappers being careful to leave the centers open. Cook, unfilled for about 6 minutes at 350. I mix my cooked sausage with cheddar cheese, diced red pepper, ranch dressing and anything else you think sounds good. There isn’t really right or wrong here, just add in the flavors you like! Fill your cooked shells and bake for another 7-9 minutes. Cool and then throw in a freezer bag. I used the rest of the raw sausage to make sausage balls. I flash freeze these on a cookie sheet lined with wax paper. After about 30 minutes, you can throw in a freezer bag and this way they won’t stick together. While I was dealing with raw meat, I used the same bowl to mix up some lamb sliders and lamb meatballs. Same exact bowl of mixed meat, I just shaped them differently so they would “feel” like we were eating something different! I didn’t really have a recipe for this, I just mixed ground lamb, a minced onion, 3 tbsp. minced garlic, parsley, cumin, oregano and salt and pepper. Yes, that bag should say “meatballs”. Oh well. The day I serve these, I plan to make a cucumber yogurt dipping sauce for them using this recipe. Remember those broccoli heads we haven’t used yet? Put it in a container with a little bit of water and microwave it till it just starts getting soft. Take some more of your pizza dough and roll it out for a stromboli. Layer ham, cheese and broccoli and you’ve got yourself 2 strombolis for the freezer. I followed this recipe for my chicken wings and instead of refrigerating them after coating, I just flash froze them and then put them in a bag. All I have left to do is deep fry them on the day of the games. I also made some bacon roll-ups. There are a lot of variations of this recipe out there but for mine I took 20 slices of white bread and trimmed the crusts off. Don’t throw those crusts away, though (do you notice a theme here?). Just freeze them and use them later for bread crumbs. Then I mix about 12 ounces of softened cream cheese, 1/2 cup chopped scallions, 3/4 cup diced roasted red peppers, garlic powder and pepper. Spread on each slice and then roll up jelly roll style. Wrap a piece of bacon around and push it to secure. Flash freeze and then put in bag to store. On the day you make them, bake at 375 for about 15-20 minutes until the bacon is crispy. I also made some jalapeno popper dip for the first time (and his picture is MUCH better than mine!). I mixed it up and then put it in a bag to freeze. I thawed this first and then spread it in the baking dish and then added the panko/parmesan topping. I’ve had great luck freezing dips that are only cream cheese and shredded cheese. If there’s mayonnaise or sour cream in it, it doesn’t seem to freeze as well. I baked this dish after it had been frozen for about 3 weeks. And what is football without desserts? Not much according to this girl. I made a double batch of peanut butter s’more cookies and then split that double batch into 3 batches. One batch got taken to friends that night and the rest was put in 2 baggies for the freezer. Aside from these things, I took my extra pizza dough and split it into freezer bags to use for pizzas later on. I can just throw some shredded chicken on it since that’s already cooked too! I also have my homemade spaghetti sauce that I can pull out and throw in the crockpot with some meatballs for meatball subs. The beauty of this, for a procrastinator like me, is that I can actually enjoy Saturdays now. I get to go to all my kids’ games, still throw together some food (quickly now) and spend the rest of the day hanging out with friends instead of in the kitchen! Just like I do with my normal freezer cooking, I made multiple batches of everything I showed you here. I should be set for a couple months here, depending on how hungry my boys are! The fall is already busy with school starting and the holiday season, so this makes it much easier for me to just relax and enjoy! Mandoline– this will speed up your work like you wouldn’t believe! Freezer bags – you buy your meat in bulk, buy your bags in bulk too! Stainless Steel Bowls– these make it easy to wipe out with a wet paper towel and keep using for your next recipe so you’re not doing a full wash in between recipes. Saves a lot of time! Freezer Cookbook – I personally haven’t used this cookbook, but a friend has it and it really appealed to me. Looked like real food and not a lot of casseroles with cream of something soup in it! GAH! UR AWESOME! 🙂 🙂 LOOOOVE this!! Oh, wow….wish I had a freezer big enough for so much food!!! How long did it take you to prepare all this? First of all that was a heck of a deal on the meats! Secondly I can not wait to try all of these!Thanks for sharing! I love this post! This has inspired me to do some serious freezing on my days off tomorrow and friday!!! Yum! How do you keep your chicken breasts from being dry when you finally use it? I’ve been using chicken thighs because my chicken breasts where just sooo dry. Like you I am working on my freezer cooking this week. Generally I do it as I cook dinner, doubling or tripling the meat I use and freezing the extra. But I did enventory last week and I am OUT of some of my staples. you’ve done it again! and can i just say that those sausage balls look a. mazing! and those deals you got on the meat are incredible! i’ve never seen meat priced that low in my area. i really do need to start freezer cooking! you’re a constant inspiration, my friend!!! Holy cow. This is the superbowl of football cooking. I’m bookmarking this baby! YOU. ARE. AWESOME!! Just voted for you again today, too! I am so jealous of your meat deals! My local store only discounts about 15-20% when it expires the NEXT day! You are not the only one too ‘cheap’ to buy the broccoli slaw. I am putting a mandolin on my Christmas list this year! Thank you for all of your fabulous ideas! Um wow… and awesome! I am so book marking this and one day I hope to be able to plan ahead like you. Everything looks great and hubby would only be so lucky to have that spread for Saturday football days! HOLY. COW. How long did this all take you?? I’m amazed. You said that dips with mayo don’t freeze as well. How did the jalapeño dip come out? @Emily Good catch, Emily!! You know what?? I didn’t even realize that recipe called for mayo and I’m quite certain I didn’t put any in! I do remember putting 18 ounces of cream cheese in, though, so maybe that balanced it out! I know of other people who do freeze dips (uncooked) with mayo or sour cream, but I always feel like mine seems a little runnier then so I just prefer not to. If you wanted to, you could always mix this up and then after it’s thawed, just add the mayo, stir and then pop it in the oven! Hope that helps! @Steph @Silver BoxesThanks, Steph! No clue really how long this took b/c I did the cookies on a different day and I think one other thing on a different day. Probably just a couple hours for the main day, though! It’s really not too bad if you have a bunch of different things going at the same time. @LauraI know I already answered you, but in case anybody else was wondering… I’m a dump and pour kind of cook, so it doesn’t matter to me too much how much chicken is in each bag. I probably put 1.5 cups in a bag, but when you’re just using these for nachos, quesadillas, sliders, tacos… you really don’t need to be exact! I love anything having to do with buffalo chicken (except actual wings) so I really need to make up several batches of shredded buffalo chicken the next time it’s on sale. Now a quick question, when you cook up a bunch of chicken at a time, how do you know how much was a pound to bag it up for recipes? Wow! Where are Weis Stores located? Those are some crazy meat prices! Thanks for the inspiring post! Natalie, those sausage stars look amazing. I can’t wait to try that recipe. It reminds me of Southwestern Eggrolls with a twist. I think I’ll have fill the freezer with appetizers like this for the holiday season. Never again would I be worried about what to bring. If only I could find meat prices like that around here. wow! Great job! I am definitely making the stromboli some time since we already make 6 pizzas at a time when we freeze them. When you say flash freeze, what do you mean? You are AWESOME!! You really inspire me. I have 3 kids and one due in January and am always on the lookout for recipes to freeze. I’ve been slacking lately but reading your freezing adventures make me want to do better. Keep up the awesome work!! Wow all of this is awesome. Those meat prices are great! This is great! I’m just seeing this now, and feel like I found a kindred spirit. We live and breathe football and, although my kids’ seasons just ended (we’re not too far from you, I don’t think, down further SE nearer “the city”) I’m still enjoying my freezer prep from way back before minicamp started in August (minus what I can to get rid of for 1) the hurricane and 2) er, Snowtober). The season is so much more pleasant when one isn’t forking over $$$ every time you turn around (snack bars KILL me!) because everyone’s going every which way, don’t you think? I even prep items for lunches to be taken fields/stadiums because invariably the games are different times and different places. Every little bit helps! Do you bake the stromboli at all before freezing? And how long/what temp do you bake it at after freezing? saw this featured on Money Saving Mom. this is highly impressive! i must do this!! great job!! Great ideas! I would also like to know how long and at what temp to back the stromboli. Also do you cover it? Thank you for the inspiration! I was just getting stressed about the upcoming football season, but following your lead is going to make it easy. Thanks!